It’s a cool autumn morning when senior student Pham Thi Thanh Huyen takes a bus trip with her friends for a one-day tour of the outskirts of Ha Noi. When the bus reaches the capital’s outskirts, they witness a tranquil scene featuring newly harvested rice fields. The fragrance of ripened rice grains seems to linger in the air. In the distance, a blanket of fog covers the remains of withered rice plants on the fields, as well as piles of straw and banana gardens beside ponds. Yet it’s not a normal tour like the ones she had taken before that a professional travel agency had organised. 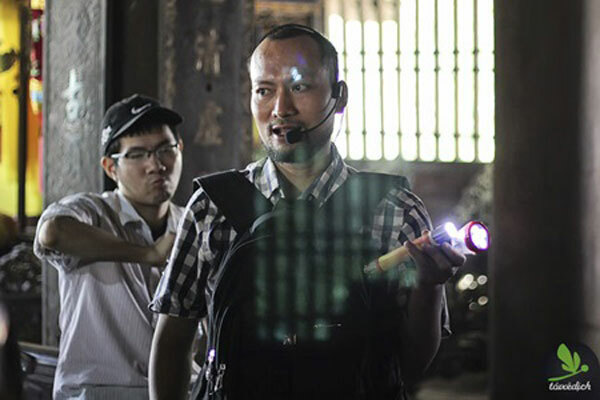 It’s a tour guided by Tran Hau Yen The, a lecturer of the Viet Nam National Fine Arts University, and one of the country’s most knowledgeable fine arts researchers. This is also the 11th of the Windy Days trips series organised by Toi Xe Dich (I Move), a non-profit project initiated by a group of Ha Noi-based students to encourage young people to travel more, live more profoundly and gain a deeper understanding of traditional Vietnamese culture. 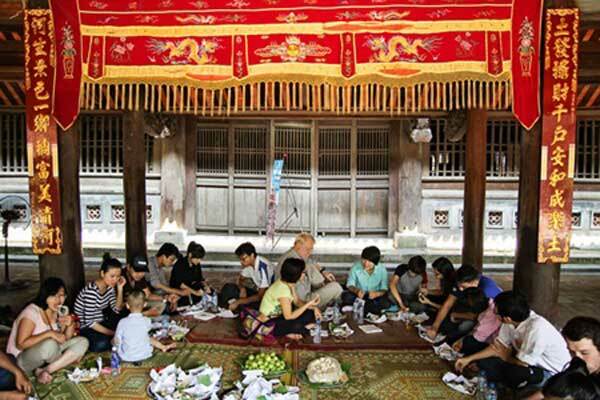 The Windy Days excursion is organised once a month, gathering mostly students in Ha Noi, as well as experts in folk culture as guides such as researcher Ngo Duc Thinh, cheo (traditional opera) master Tran Dinh Ngon, cheo director Doan Vinh and noted cheo artist Thanh Ngoan. On this trip, the students explore folk sculpture at Tho Ha Temple in northern Bac Giang Province and Phat Tich Pagoda in nearby Bac Ninh Province. At their first destination, many of the Windy Days members understand for the first time the beauty of folk sculpture on wooden pillars and decorative panels at Tho Ha Temple, aged more than 300 years. 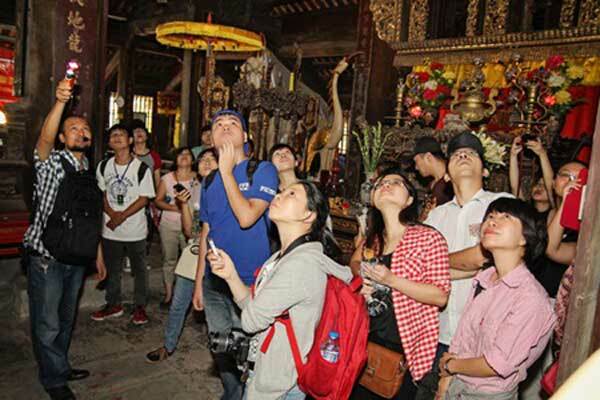 “In a normal tour organised by professional travel agencies, the guide will not explain and provide much detail on the architecture,” Huyen says. After The’s explanation, tour participants chat with an elderly resident who has taken care of the temple for dozens of years to understand more about the temple’s history. Holy picnic: Toi Xe Dich members enjoy lunch at Tho Ha Village Temple. “Seeing is believing. The journey offers a really deep experience into traditional arts and culture, though I have to find the best way to explain them effectively,” notes The. At lunch time, the participants enjoy a simple meal prepared by the project initiator. At Phat Tich Pagoda, The spends much time talking about holy animals outside the pagoda, their positions and the origin of stone lions. He explains that one can distinguish between a beautiful statue of Buddha and a normal one depending on the carving lines and the harmony of details on the entire statue. “That statue is beautiful not only because of a mastery of carving skills but also because of the Buddha’s calm face and costume,” he adds, pointing at a statue of Buddha inside the pagoda that was cast in 1057 and has been considered as one of Viet Nam’s fine arts masterpieces. That explanation signals the end of the trip. Huyen and many other participants cannot hide the sadness on their faces. Fine folk: Fine arts lecturer Tran Hau Yen The guides a Windy Days trip to Tho Ha Village Temple in northern province of Bac Giang. According to Nguyen Thi Thu Ha, the project head, since June 2012, the group has successfully organised 11 Windy Days trips that gathered hundreds of local students, including the ones to explore more-than-100-year-old Long Bien Bridge; cheo art; hau dong, a ritual of spirit mediumship in connection with Dao Mau, a Vietnamese Mother Goddess religion; and the handicraft art of printing Dong Ho paintings. A graduate of Ha Noi Foreign Trade University, Ha was named runner-up of the 2012 60s Chinh Phuc Nha Dau Tu (60s Investors’ Conquest Contest), a playground that Viet Youth Entrepreneurs launched to encourage students to display their knowledge and express their opinions. Right after the contest, she expanded her Vietnam Travel Radio project, which she submitted to the contest, into toixedich.com, focusing more on promoting the country’s culture and art among local youth and tourists. “Each of the ‘Toi Xe Dich’ trips is a reflective journey exploring and looking back on time-honoured traditional values. The trips turn participants’ pride into motivation to contribute to the country later on,” says Ha, who now works as a marketing agent for a local company. “‘Move’ in our project title is not only moving from space to space but also a move or change in thinking and perception,” says Ha. “The series has gathered students and older people in the city. We hope to gather more foreigners in the city as well as multiply the model in many other localities throughout the country. Join us to see, learn and love,” jokes Quynh.